We had a busy past couple days. 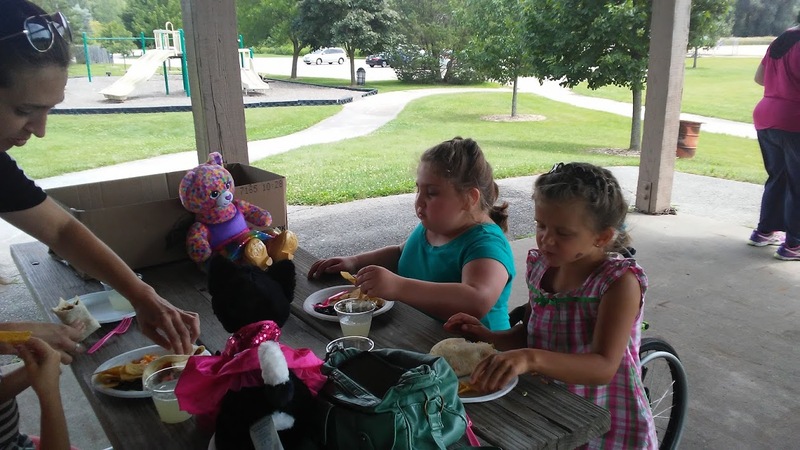 Namine had a couple friends over for her very first slumber party, and then we threw her a birthday party at the park. If you’re not acquainted with it, part of the whole “making your own stuffed friend” process is that you get to help the employee stuff your toy. There’s a foot pedal that you step on which pumps the stuffing in, while the employee makes sure the stuffing gets evened out inside the toy. 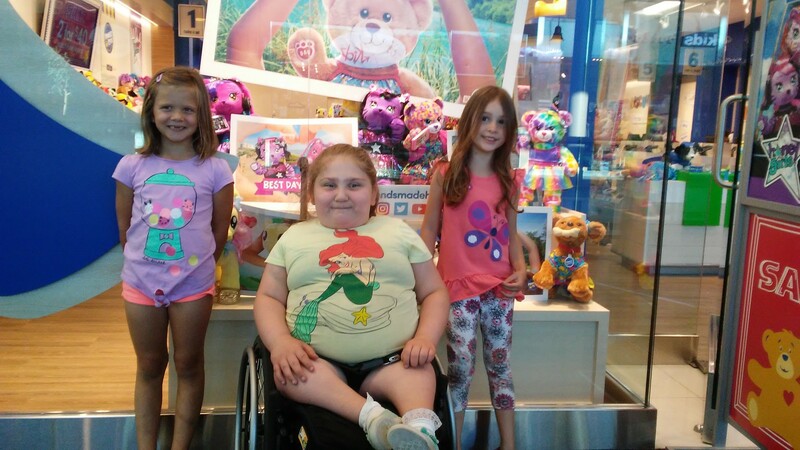 The last time I was in a Build-A-Bear with Jessica and Namine, the employee handed the foot pedal to Namine (who, of course, was in her wheelchair). This time, though, Namine didn’t ask for it to be handed to her. She rolled up to it and popped a wheelie, landing neatly on the pedal. I was surprised, but I suppose I shouldn’t be. She’s always figured out for herself how to do what she needs to. When we got home, the girls played with their new bears (although come to think of it, none of the girls actually got bears) while Jessica and I got the rainbow cake batters ready. 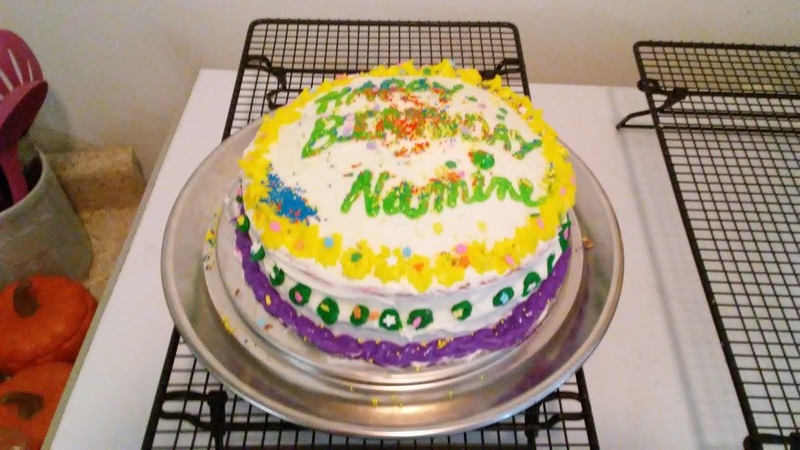 Yeah, Namine wanted a rainbow cake for her birthday, which meant six bowls of batter. Extra dishes? You bet. Extra mess? With three girls, you better believe it. Did we mind? Not a bit. 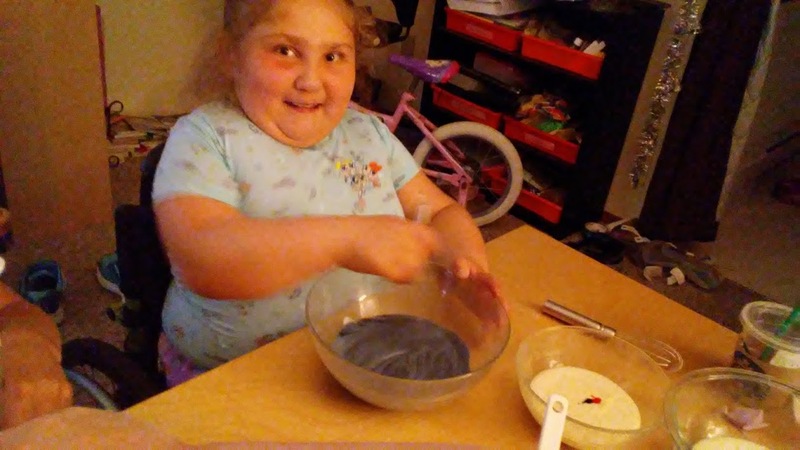 Making your own cake holds more appeal than just buying one, not to mention making some great memories. True to our suspicions, the girls did not sleep much. They were up past midnight and up around 6:00 in the morning. 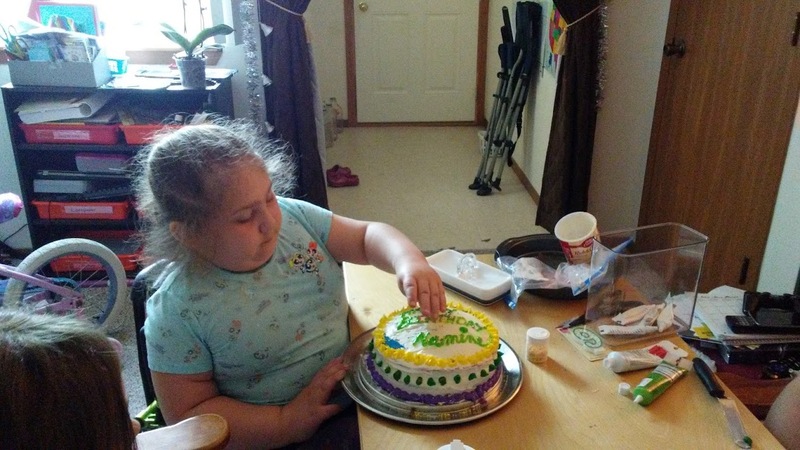 After the initial frosting and lettering of the cake (which Jessica handled), the girls were put completely in charge of the cake. Namine had a great time at her birthday party. Of course these things are always over a little too soon. Jessica and I were pretty exhausted when we got home, but Namine was still go go go. (We took a nap while she played.) Oh, to have the energy of a child!